Maf Garnoush in Nepali for “Apologies” – and I meant to get the FTG Nepal staff picture up with names about five days ago…so maf garnoush for the delay. 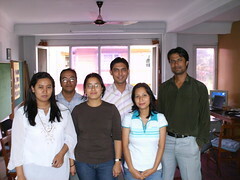 Nina Shahi, Bijay Munankarmi, Sabina Singh, Ashish Ashikari, Radhika Maskey and Raj Kumar Shukla. Nina is the Coordinator at FTG Nepal and I am primarily working with Sabina. Raj has just finished his time at FTG Nepal and we had a farewell lunch for him last week. There are a few people missing from the picture – I’ll work on including them soon.